Oh, ABC. Or, really, I should just say, oh, television. This year's crop of new Fall TV shows have disappointed me pretty much across the board - every network, almost every show. It's about a month into the new season, and there's no way that my only new appointment television show right now is CBS's Hawaii Five-0. One show does not a successful new tv season make! It's so bad I'm not even taking a whole magnetpost to whine over the lack of good shows. 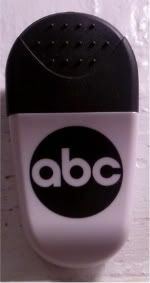 I'm just using this ABC swag magnet for today (one of my few magnets that double as a functional clip), because I just got done moving most of my entertainment-related magnets to the side of my fridge, all the while, cursing my always dwindling wall space. One look at my latest magnets slideshow reveals some empty space to fill, so it's not like I'm actually running out of room. My problem is my need to keep them all together in their groupings, and with an ever-expanding collection, it's hard to do that. 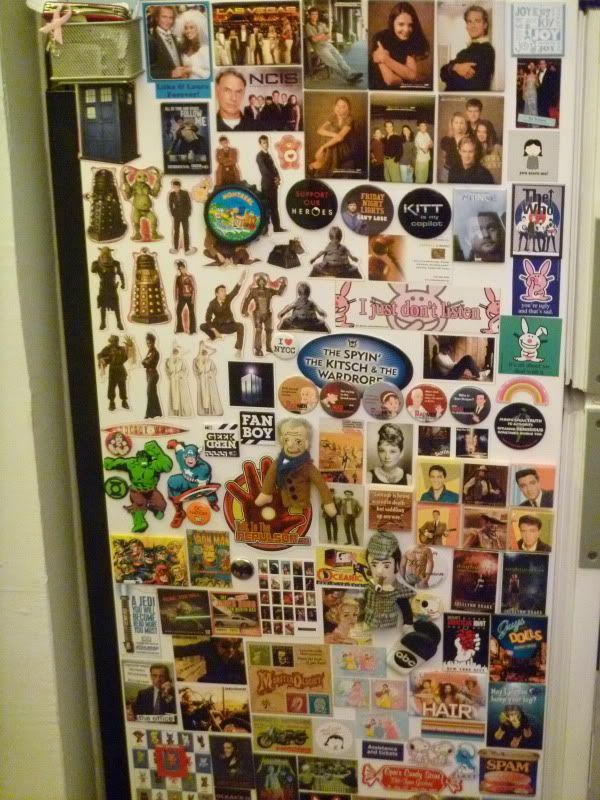 So the front of the fridge is my little art gallery, one panel has all the dimensionals, one has all the joy magnets, one has all the picture magnets, one has all the acrylics, one has all the Monets, and so forth. And within those, are subgroups of tile magnets, hanging feet magnets, floaty magnets, etc. See? It's kind of crazy-making. Especially today, I think. The thing is, she has hers all in her sheet-metal lined spare bedroom! Dudes! And, it's all white and pretty, and the magnets all have breathing room. And if you look closely at the pictures, the magnets are grouped together, all nice and neat, while mine's beginning to look like the walls of IKEA. Sigh. It's definitely no reason to move, but damn, do I have magnetroom jealousy right now.